LHP Telematics Trusts ACTIA Telematics Hardware Solutions - LHP Telematics, LLC. ACTIA Corporation is proud to announce collaboration with LHP Telematics of Westfield, Indiana. This joint effort will provide customized telematics solutions that enhance connectivity solutions while optimizing cost for our customers. ACTIA’s new TGU-Ruggedized device will be the hardware selected for LHPT’s Big Data Analytics, which will deliver deep insight into customers’ fleets to help solve business issues and provide better service of intelligent applications. The TGU-R will leverage LHPT data platform to reduce downtime, track and compare assets and create customized reports that put customer information to work to their benefit. “ACTIA knows how to build rugged telematics devices and that is what our OEM customers are looking for. The TGU-R has all the high end features we need to create connected assets at a price point that makes the initial decision a lot easier to make. The combination of features, ruggedness and price set this device apart from the competition,” says Travis Jones, CTO of LHP Telematics. ACTIA TGU-R is a compact high-speed on-board vehicle/machine communications device for telematics and remote diagnostics functions. A customizable hardware platform with multi-communication channels and data security features built in. This automotive-grade product is designed for the harsh environments common in Off-Highway applications. 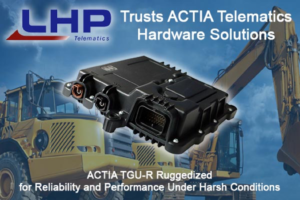 “The TGU-R Access is the culmination of the many requests that ACTIA has had over the years, for a full-featured telematics gateway that can also withstand the elements in rugged environments. Although we have had success with many generations of OEM telematics devices in the automotive and truck sectors, ACTIA now has a telematics gateway for businesses with applications in farming, forestry, mining and more… Even the marine market is well served with the TGU-R Access, which speaks volumes about how well it can withstand the elements”, said Al Chami – ACTIA Corporation’s Director of Business Development. ACTIA Corporation (Elkhart, Indiana USA) is part of the ACTIA Group, an international group based in Toulouse, France that specializes in adding value to its customers by providing innovative electronics and diagnostics solutions. ACTIA US has been manufacturing quality vehicle electronics and diagnostic equipment for growing markets such as Off-Highway, Bus & Coach, Truck & Fleet, Marine and Specialty Vehicles for over 30 years. ACTIA’s solutions are known for their reliability, quality, and performance across multiple OEMs serving multiple markets. Our wide-ranging experience in instrumentation, displays, controls, diagnostics, and wire harness design provide customers with a turn-key solution for any given application. ACTIA’s focus on Innovation, Quality, and the Environment is at the core of the company’s commitment to continuous improvement. This drives us to deliver a broad range of innovative solutions for customers world-wide. LHP Telematics builds custom white label telematics solutions for heavy equipment OEMs. We understand the ruggedization requirements, CAN needs and global rollout issues that OEMs face when they try to implement telematics. In addition to OEM solutions, LHPT offers mixed fleet solutions focused on equipment dealer networks. This allows an OEM and their dealer network to take full advantage of telematics to gain the maximum value possible at every level of the organization.